The event took place at the Phillip Lim store in Soho, NYC. The room was filled with fashion industry professionals from brands all over, from retail to corporate employees. Brands as Ralph Lauren, CFDA, and Teen Vogue came to support and learn about diversity and cultural appropriation issues faced in fashion. 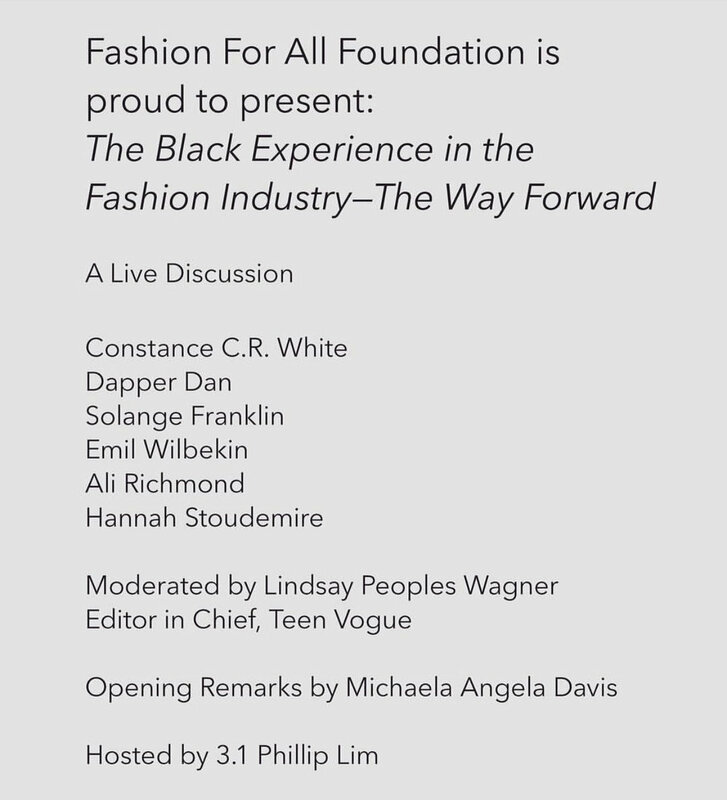 The idea that African American culture has great influence on the luxury fashion industry is clear. Why is it that the culture that influences the industry most, often gets culturally disrespected? Also, why is there no black luxury houses especially being that the black purchasing power is stronger than ever? Dapper Dan shared with us his struggles of being underground and how Black Twitter played a significant role in bringing him back to the spot light. “We need to find out how we can reach luxury” said Dapper Dan. He continued that luxury is about symbolic meaning. He’s been traveling the world seeking artifacts with deep cultural connection that can inspire his designs. Dapper Dan’s partnership with Gucci was also addressed as he planned to continue to work with the Italian fashion house to prevent future ”missteps” by helping them understand the black culture. One question that remains is where do we go here? There is no one single right answer. I believe the most effective would be African Americans focusing on connecting to their African heritage. In the DNA lies pride and identity. That identity has been lost due to the Atlantic Slave trade. African Americans must not stop searching where their family comes from. We seek pride and status when wearing European brands. The honest truth is, if you’re black you have no historical connection to these brands unless you are European. We connect the idea of wealth with these brands because it is real, they are wealthy. But, the influence that our culture plays on this industry is what’s being sold often. That needs to change. I believe that black+ African history will lead the future and African American’s will finally touch the luxury level. It will begin with designers like Kanye West, Dapper Dan and Virgil Abloh who will open the gates for young designers by leaving historical legacies. I look forward to the next event by the Fashion For All Foundation. Please share with me your thoughts on ways to leverage the playing field. Posted on March 24, 2019 by Javone Armada and filed under blog and tagged gucci luxury fashion dapper dan fashion for all foundation Phillip lim soho nyc cfda Ralph lauren teen vogue vogue gq louis vuittin Louis Vuitton Prada monkey racism diversity African culture black twitter fashion industry luxury fashion the way forward.